This picture reminds me a lot of this poem I used to read for my Intro to Psychology class. I know you're probably thinking....why was she reading poetry in psychology? Well, I was reading this poem because it is an excellent illustration of using projection as a way of coping. Projection is a defense mechanism where you project your feelings onto someone else. If you'd like to read it, the poem is by Denise Duhamel, titled How It Will End. My students always seemed to enjoy hearing it read. I've been wondering; best of luck, my fingers are crossed for you! Keep us updated on the job, we have been praying for you! I hope you hear something soon on the job! How exciting to be moving into new things! And I love that picture! Haha, that is very interesting and cute. I hope these two end up in the same manner too. All the very best for your job search, wish you get the call soon. Keeping my fingers crossed!! Although I am sure you are a shoe in..
Wow I just came back from Googling "How it will end" WOW I cannot believe how differently men and woman think and place themselves in the lives of complete strangers so quickly not really knowing but possibly knowing what the scene that runs through the minds of others because it is their thoughts about their own relationship. Do you get that? Sometimes I have a hard time expressing what I think. I think we all do that and the lesson in my head is we may think we know and think everyone thinks the same as us but we really do not. I love the picture! It looks like they're an "old married couple" hehe! Thanks for brightening my day! My fingers are crossed for you !!!!! You should get a job as a photographer. So glad to hear! Hope the new job is all you want it to be!! Hang in there Lisa and I hope the job opportunity pans out. The chicken coop does frequently mimic the human experience. Great shot Lisa! Loved the poem--really realistic! It goes well with the photo. I've been wondering about your job search, so I'm glad to hear that maybe the waiting will soon be over. Good luck with that! I'll be thinking about you. OOOOH, the rooster looks so shiny . . what a beautiful photo - it's almost better than real. This position - or something better - because - for sure - Your Good is Running After You Right Now. I wish you the best in finding a job. I'm sure it will all work out! I've not heard of this poem, gotta go check it out. Thanks for the update! It sounds like we could hear good news soon. Cute pic of the roosters who do appear at odds. I will check out the poem too. Sounds like you are about to be employed. Yay! Thanks for the update. With that rooster... I am sure once you get your job, you won't need an alarm clock to get up with. I love this shot, and also the way the sun is shining on the one on the left's feathers. Please let us know about the job when you get it, the hours, and a little bit about what you will be doing. Gosh, I hope it doesn't cut into your blogging time! hi Lisa! Merrells are great shoes. They are supportive and sensible. I have to have both in my collection. Sensible and ridiculous is more me. I love this photo. Chickens have strange body language, don't they? That sounds so hopeful on the job front! oh, that hen is mad! I love that photo! Too funny. Best of luck with the job search! Hope you hear back soon! Looks like my husband and I sometimes. Nice to get close to working, but then I hate to give up my free time. Cute pic and fingers crossed for good news! 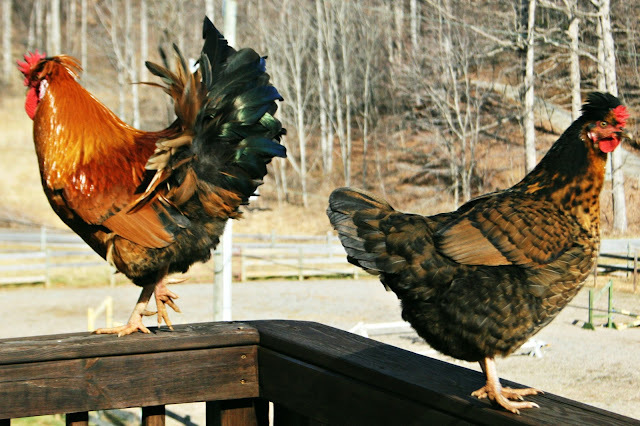 I totally see the poem in the chickens' posturing. Good luck--I just know the job is yours! Keeping you in my prayers. The hen is too cute! I am looking up the poem. I might want to share it with my grandchildren some day. Best of luck with the job search. I know first hand that it can be very trying. Hoping it all works out and you get the position Lisa. All the best to you! Oh how I love this photo! Crossing my fingers for you on the job, Lisa! We just read the story too!! Very interesting. Love the picture, Lisa. You know I wish you the best with the job. Glad to hear you are having some luck with the job search. I was hoping you would update us on the job. This one would be great - but there will be others if it doesn't work out. It is just a door. I enjoyed that poem! Yep, I have an in-law that is notorious for projecting, but I'll bet I do the same thing without realizing! Hope things go well with the interview! I love that picture! They do look like they are fighting. Good luck with the job! It sounds promising. You're a shoe in!!! I read the poem, very interesting! Happy weekend! I looked up the poem; the picture illustrates it well. Good luck on the potential new job. I'm sure you got the job! Congratulations! I hope you get the job you want. I am familiar with that poem and it is one of my favorites. I hope you get that job. Love the photo.